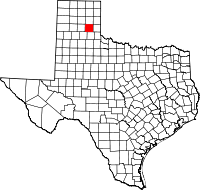 Donley County is a county located in the U.S. state of Texas. As of the 2010 census, its population was 3,677. Its county seat is Clarendon. The county was created in 1876 and later organized in 1882. Donley County was established in 1876 from land given by the Bexar District. It is named for Stockton P. Donley, justice of the state supreme court. There are several historical sites listed on the National Register of Historic Places in Donley County. According to the U.S. Census Bureau, the county has a total area of 933 square miles (2,420 km2), of which 927 square miles (2,400 km2) are land and 5.6 square miles (15 km2) (0.7%) are covered by water. As of the census of 2000, 3,828 people, 1,578 households, and 1,057 families resided in the county. The population density was four people per square mile (2/km²). The 2,378 housing units averaged 3 per square mile (1/km²). The racial makeup of the county was 91.41% White, 3.94% Black or African American, 0.89% Native American, 0.10% Asian, 2.72% from other races, and 0.94% from two or more races. About 6.35% of the population was Hispanic or Latino of any race. Of the 1,578 households, 24.80% had children under the age of 18 living with them, 56.70% were married couples living together, 7.50% had a female householder with no husband present, and 33.00% were not families. About 31.40% of all households were made up of individuals, and 17.00% had someone living alone who was 65 years of age or older. The average household size was 2.30 and the average family size was 2.86. In the county, the population was distributed as 22.40% under the age of 18, 9.80% from 18 to 24, 20.60% from 25 to 44, 25.50% from 45 to 64, and 21.70% who were 65 years of age or older. The median age was 43 years. For every 100 females, there were 94.40 males. For every 100 females age 18 and over, there were 91.70 males. The median income for a household in the county was $29,006, and for a family was $37,287. Males had a median income of $24,375 versus $18,882 for females. The per capita income for the county was $15,958. About 10.50% of families and 15.90% of the population were below the poverty line, including 20.90% of those under age 18 and 15.90% of those age 65 or over. The Saints' Roost Museum in Clarendon is dedicated to the American West. The Harold Dow Bugbee Ranch, formerly owned by the Western artist and his second wife, Olive Vandruff Bugbee, also an artist, is located in Donley County. The legendary cattle baron Charles Goodnight spent his later years in Donley County. It was also the home of historian Harley True Burton, author of A History of the JA Ranch, which Goodnight formerly co-owned. Burton was president of Clarendon College and the mayor of Clarendon from 1955 to 1963. The JA Ranch is located in the counties of Donley, Hall, Briscoe, and Armstrong. U.S. Highway 287, which runs through the county, has a modern rest area, but no longer offers wi-fi. The rest area also offers sanctuary from weather offering a tornado shelter in the main building. ^ a b "State & County QuickFacts". United States Census Bureau. Archived from the original on July 9, 2011. Retrieved December 10, 2013. ^ Alvarez, Elizabeth Cruce (November 8, 2011). Texas Almanac 2012–2013. Texas A&M University Press. pp. Contents. Retrieved November 17, 2013. ^ Gannett, Henry (1905). The Origin of Certain Place Names in the United States. Govt. Print. Off. p. 107. ^ "2010 Census Gazetteer Files". United States Census Bureau. August 22, 2012. Retrieved April 22, 2015. ^ "U.S. Decennial Census". United States Census Bureau. Archived from the original on May 12, 2015. Retrieved April 22, 2015. ^ "Texas Almanac: Population History of Counties from 1850–2010" (PDF). Texas Almanac. Retrieved April 22, 2015.